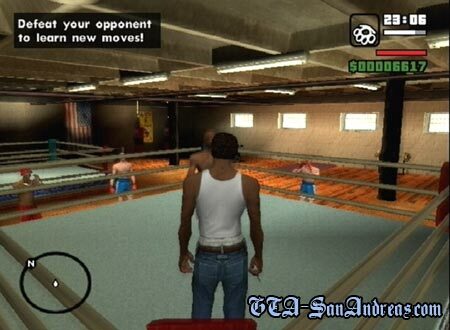 Gyms are used to good effect in San Andreas. You can lose weight, train up your skills and build up Stamina and Muscle as well as learning new fighting moves. While all of this may seem like an added extra, some of it is required for 100% completion. This being the fighting moves. You'll need to enter the gym in each city, build up your muscle and stamina, then stand in the red circle next to the trainer of the gym. You'll then have to fight him and if you win, he'll teach you some new moves. Fighting isn't hard, just lock onto him with R1 and then mash the Triangle or Circle button until he falls down, then keep hitting him as he tries to get up. You'll need to visit all three gyms and beat the trainers before you'll know all of the moves and earn your percentage and you can visit any of the gyms again and overwrite the current move set. Because of the simplicity of this task, it doesn't actually require a guide as such, but a little note such as this explaining that it has to be done will go a long way in helping the strugglers wonder where their missing 2% has gone.